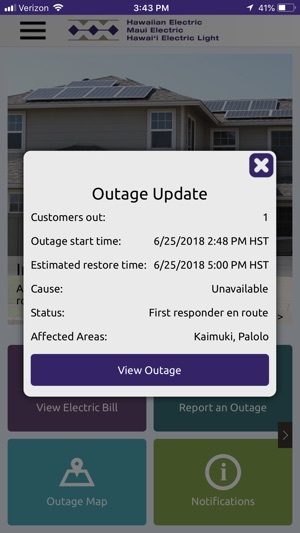 The Hawaiian Electric or HECO mobile application is a great way to view information on known outages for the island of Oahu. 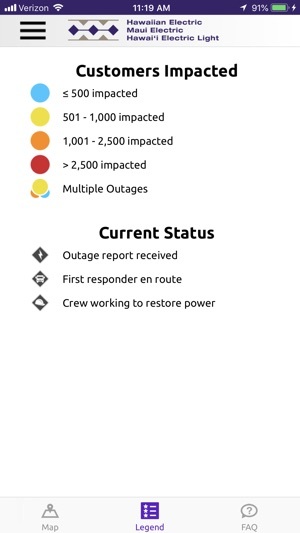 Get up-to-date outage information, such as areas impacted; number of customers affected; and estimated restoration time. 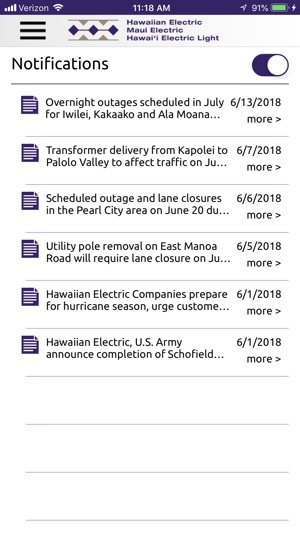 Receive important information from Hawaiian Electric with our alert and news notification service. Be advised of outages near your current location, using the geolocation feature on your mobile device and sign up for alerts on a specific outage. 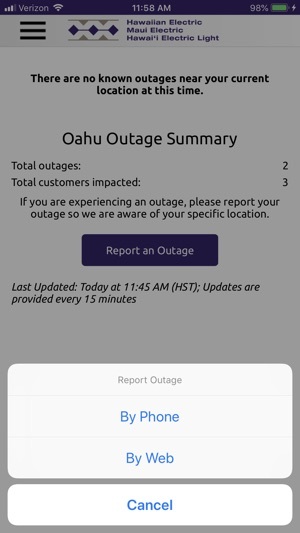 You can also report an outage directly or get access to the Oahu trouble line from the mobile application. 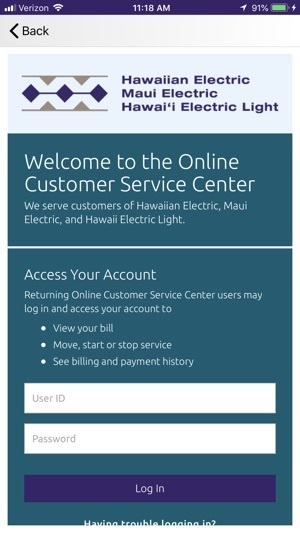 You can now access your online account to view your electric bill, as well as stop/move your electric service if needed. Payments can be made with a credit card through Western Union. 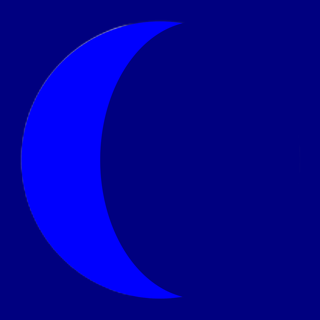 The ability to start new electrical service has also been added. 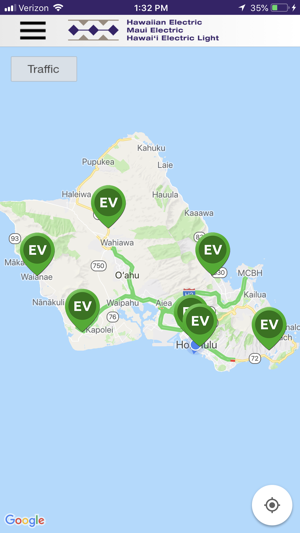 In addition, you can access an interactive map to find any of our electric vehicle (EV) fast chargers across the islands we service. 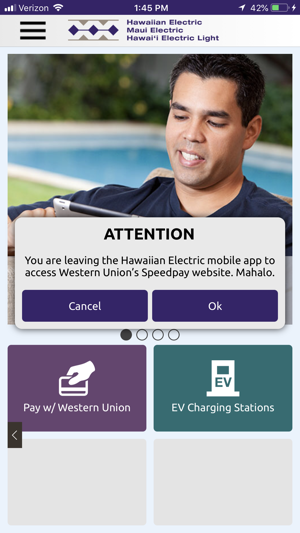 The map will allow you to find a fast charger close to you and receive information about the charger type and location. 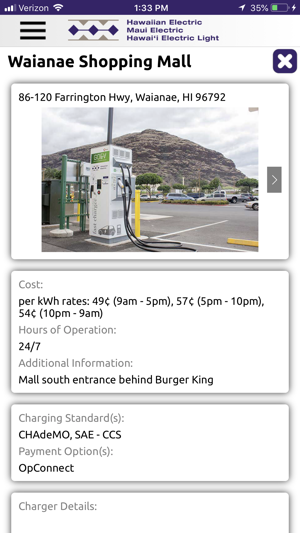 Step-by-step driving instructions are also available to get to your EV fast charger quickly! More features will be available as we continue to develop and update this application in the future to make it easier for customers. 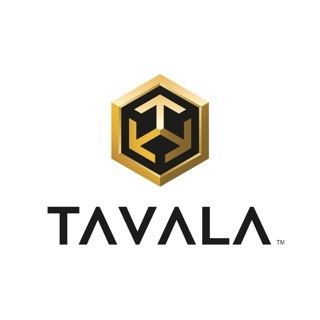 - Updated Pay w/ Western Union link to point to their new payment portal. I love being able to see my bill and be able to pay it on my phone. I just get really annoyed at the fact that if you press the back arrow it’ll make you re-login to your account. I just tried to do something with autopay and had to log in 5 different times. Wish it came with a finger print authorization or even just a remember me option. Its my phone, and my account so it’d be nice if it just kept me logged in all the time or at least only ask for my login info once every 20-30 minutes. 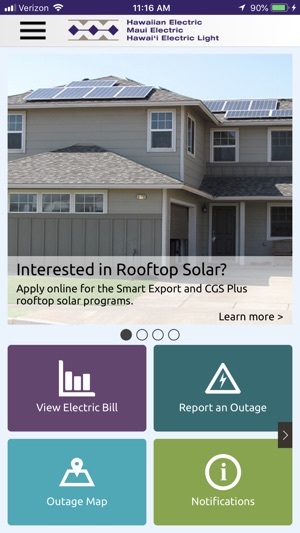 The app makes you login to view your bill. Then it makes you log in AGAIN with your account number. Then only when your ready to pay does it inform you there will be $1.99 charge to pay by credit card (which is ridiculous since automated payments save the company money). Then next time you have to do the double log-in all over again. Use Touch ID to save and streamline login you morons. 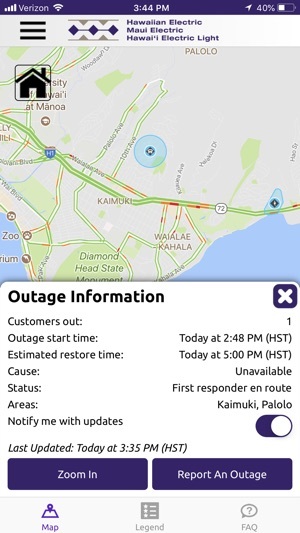 They have to do a better job estimating and communicating repair times on the outage map. Not ok when they know it’s going to take 15 + hours to fix but they keep saying “in an hour, in an hour” and keep updating to “in an hour”. It’s ok if it’s going to take some time just let us know so we can plan accordingly.